Just in time for the holidays! The US-based restaurant chain, Red Lobster, has released its “Holiday Seafood Celebration,” which features a variety of special holiday meals, desserts, and cocktails. You might be wondering what this has to do with us at CSF. We love a delicious lobster meal of course, but as leaders in the sustainability industry – we also must pay close attention to where our food is coming from! As a part of Red Lobster’s new Seafood Celebration, the chain is now offering a “Wild-Caught Lobster and Shrimp-Trio.” This dish features wood-grilled Maine lobster with Norway lobster mac-and-cheese, paired with a garlic-grilled red shrimp skewer and panko-crusted red shrimp. Sounds delicious, doesn’t it? The good news is, Red Lobster has an impressive track record when it comes to sustainable aquaculture and the company has been quite vocal on their stance. The company website says that all of their suppliers must follow their industry-leading quality and safety standards. 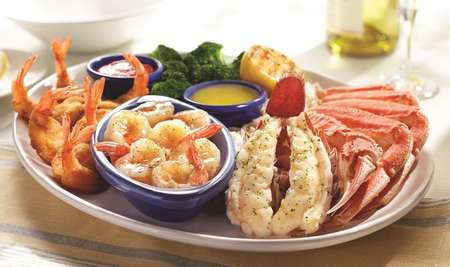 Red Lobster lovers can also dine knowing all of their wild-caught lobster is caught in a safe and sustainable way. Upon further research, we were also happy so see that our vision for sustainable aquaculture falls in line with Reb Lobster’s. They played an integral role in launching the Atlantic Lobster Sustainability Foundation, which helps protect lobster populations in our oceans. The non-profit works with fishermen, buyers, and other stakeholders to preserve the lobster population and keep the industry stable. Red Lobster also has vowed to never serve lobsters that weigh over 4 pounds, because these lobsters produce the most eggs – another reason why we never take full-grown lobsters from the wild. At CSF, our top priority is protecting the BVI’s lobster population so local fishermen can continue to fish freely. We strive to ensure that Caribbean families, who have relied on the sea for generations, can confidently pass down the trade to their children, knowing there is a vibrant future ahead of them. We are pleased to see that a large franchise such as Red Lobster is also making strides towards a more protected ocean so we can carry on our sustainable traditions. That Lobster and Shrimp Trio is sounding pretty good now, isn’t it? How Do You Know the Seafood You’re Buying is Actually Sustainable? 3 Mouth-Watering Lobster Recipes You need to try this Spring!